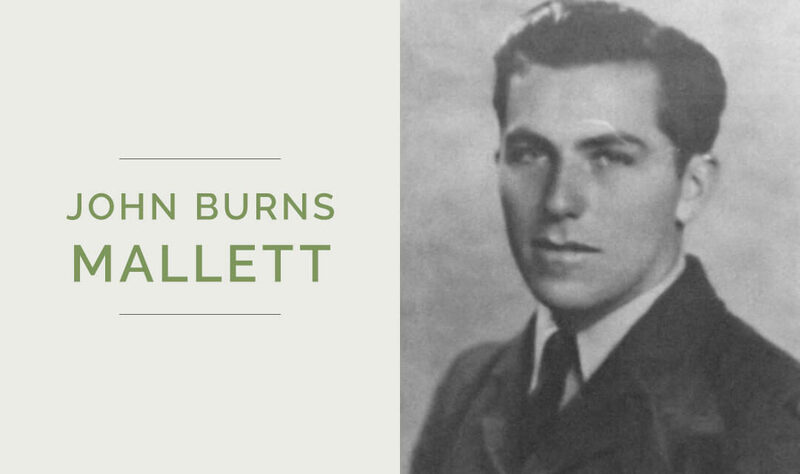 John Burns Mallett was born in Wallace Township on May 11, 1918, and enlisted in the Royal Canadian Air Force in 1940. Mallett was sent overseas in 1941, and took courses to become a flight engineer. He attained the rank of Flight Sergeant by the time of his death. On February 18, 1943, Mallett was said to have “seen bombing action” at Wilhelmshaven, where he helped to bombard a German naval base. Mallett was killed in action on March 2, 1943, and his funeral was held in England on March 5, 1943. The Palmerston Observer notes that Mallett was “always interested in things mechanical”, perhaps explaining why he was drawn to serve in the Air Force. Shortly after his funeral in England, he was honoured locally with a service held at the United Church in Palmerston, which was described by the Observer as being an “impressive service”. Mallett is buried at the Scampton (St. John the Baptist) Churchyard in England. You can view John Burns Mallett’s Commonwealth Grave Commission page here. “Burns Mallett R.C.A.F. Casualty.” The Palmerston Observer [Palmerston] 11 Mar 1943: 1. Print. “J. Mallett Sees Bombing Action at Wilhelmshaven.” The Palmerston Observer [Palmerston] 18 Feb 1943: 1. Print. “Many Honored Young Flier on Sunday Last.” The Palmerston Observer [Palmerston] 1 Apr 1943: 1. Print.